According to the Centers for Disease Control and Prevention (CDC), in 2010, the cost of heavy alcohol use in the United States was approximately $250 billion. There is no dollar amount that can be put on the physical injuries and emotional distress that result from heavy alcohol abuse. Most of the costs occur as a result of binge drinking (often defined as drinking four or more alcoholic beverages on a single occasion for women, and five or more drinks on the single occasion for men). Individuals who are intoxicated and drive motor vehicles or cause damage are often held liable for their actions. In addition, those who serve intoxicated people may also be responsible for the damage that these individuals cause. Bartenders can be particularly effective in limiting the damage that an intoxicated person may potentially cause by simply cutting them off. Bartenders who serve intoxicated patrons may be at risk for legal and civil charges as a result of these actions. 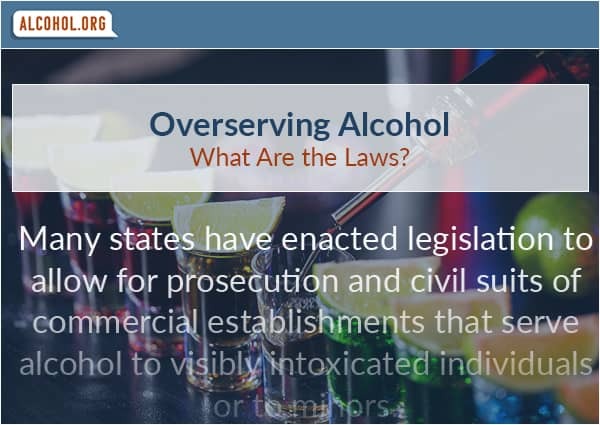 Many states have enacted legislation to allow for prosecution and civil suits of commercial establishments that serve alcohol to visibly intoxicated individuals or to minors. The term dram shop or dramshop is used to describe a tavern, bar, restaurant, or other commercial establishment that serves alcoholic beverages. Dramshop was the term used to refer to establishments where spirits, such as gin, were sold by the spoonful or dram, a small unit of liquid measure. Dramshop laws originated during the Temperance Movement in the United States. Dramshop liability or dramshop laws refer to laws governing commercial establishments that sell and serve alcoholic beverages to people who are visibly intoxicated, or to minors, who go on to cause injury or death to others (third parties). The laws are designed to protect the public from potential danger as a result of commercial establishments selling alcoholic beverages to people who are intoxicated or to minors. In recent years, organizations like MADD (Mothers Against Drunk Driving) have lobbied for stricter dramshop laws and for more severe penalties associated with the violation of these laws. Bartenders who serve alcohol to visibly intoxicated persons, who then cause injury or property damage to third parties, can be held accountable as a result these laws. Many establishments that serve alcohol have some form of liability insurance to protect them in these instances. How Do These Laws Work? The information in this article is not attempted to substitute for legal advice. Any individual who needs legal advice regarding any matter related to the use of alcohol or drugs should consult with a licensed attorney. The information in this article is general in nature and designed to be educational; it is not designed to be used for legal purposes and makes no claims of any type of utility for that purpose. Prior to the formal imposition of dramshop laws, the court system often discouraged or even prohibited lawsuits against the sellers and servers of alcoholic beverages due to the notion that serving alcohol did not actually cause the damage that may have occurred as a result of the actions of a heavily intoxicated individual. There appear to be two specific categories of dramshop cases: first-party dramshop cases and third-party dram shop cases. First-party dramshop cases occur when the person who consumed too much alcohol prosecutes the bartender or establishment that served them to receive compensation for any injuries or damage they have created while under the influence of alcohol. It appears that many states that have dramshop laws do not allow for prosecution in first-party dramshop cases because there is a presumption that individuals should be responsible for how much alcohol they consume. This also relates to the prosecution of DUI cases, such that individuals who are arrested for DUI cannot blame the person who served them for allowing them to drink and drive in most states, and cannot escape prosecution for DUI because of the claim that they were not responsible for how much alcohol they consumed. However, it should be noted that in many states, there may be provisions that allow minors or the guardians of minors to prosecute these cases because in all states, individuals under the age of 21 are not allowed to drink alcohol legally (except for very defined and specific cases in a few states). First-party dramshop cases are also very hard to prosecute and win. It’s tough to convince a jury that they should give an adult a financial sentiment because they consumed too much alcohol, and caused an injury or damage as a result of their own actions. A third-party dramshop case occurs when the intoxicated person causes injury or damage to some other person or other party. For instance, a person who is drinking in a bar, visibly intoxicated, and impaired, continues to receive alcohol; they then later attempt to drive home and get in an accident. As a result of the accident, the intoxicated person injures some other individual (the third party) and that person sues for damages. Prove that the bartender or establishment sold or gave alcohol to the person. Demonstrate some relationship between the person’s level of intoxication and their use of the alcohol that was sold or given to them. Provide evidence of recklessness on the part of the bartender or establishment, such that they intentionally served alcohol to a person who was visibly intoxicated and disregarded obvious signs that serving alcohol to the person could potentially cause damage or harm to others. Prove that the bartender or establishment knowingly served alcohol to an individual who was addicted to alcohol and/or drugs. Demonstrate that the establishment or bartender served alcohol to a minor. Demonstrate that the act of serving alcohol to the individual was intentional. Again, different states have different stipulations, but as a general rule, the third party or representative of the third party must demonstrate evidence related to the above conditions. Some states may have limitations on the stipulations. Other states may have other restrictions that only apply to DUI cases or other specialized cases. Certainly, it becomes much easier to demonstrate that an individual was intoxicated and should not have been served more alcohol if there are outside reports that the person was binge drinking (had consumed more than 4-5 drinks within only a few hours time), visibly smelled of alcohol, was slurring her words, and was having difficulty walking, standing, etc. Consequences can include significant fines, loss of license or employment, lawsuits that can result in significant financial penalties, and even potential jail sentences, depending on the state and/or circumstances of the case. What States Have Dramshop Laws? Is It Ever Legal for Minors to Drink? Are There Laws Against Hazing?